Forget the cliches, this is a genuine once-in-a-lifetime opportunity: freefall into the majesty of the seventh continent. The ultimate destination for experienced skydivers, Antarctica’s pristine wilderness - with the outstanding support of a team of specialists and experts - is waiting for you. We ask you to arrive in Punta Arenas, Chile at least two full days prior to your scheduled Antarctic flight in order to fully prepare you for your upcoming experience. These days also allow a buffer for flight and luggage delays should your travels to Chile not go as scheduled. We do not hold Antarctic flights for delayed passengers or luggage, so be sure to keep your skydiving equipment in your carry-on. On the morning before your Antarctic flight, we will come to your hotel at your scheduled Luggage Pick-Up time. Please be ready in the lobby with ALL of the luggage you will be taking to Antarctica including checked luggage and items that will be carried on. We will weigh everything but will only collect your checked luggage at this time. You will need to separate your luggage into three categories: Checked Luggage, Carry-on Luggage, and Left Luggage. The evening before your Antarctic flight, you are invited to our office for an important safety briefing. Here, we will describe the flight dispatch process, update you on the current weather, and prepare you for arrival at Union Glacier. Please stay to enjoy hors d’oeuvres and pisco sours served over Antarctic ice with your fellow travelers. And don’t forget to take your boarding pass and commemorative cocktail glass with you! We will call you at your hotel in the morning to advise you of current conditions in Antarctica. If the weather is suitable for our flight, we will pick you up at your hotel within the hour. Please meet us in the lobby with hotel bills paid, ready to board the bus. At the Punta Arenas airport, we board our chartered jet for the 4¼ hour flight to Antarctica. Our route crosses the Drake Passage, then follows the west side of the Antarctic Peninsula and the spine of the Ellsworth Mountains. We land on a naturally occurring blue-ice runway on Union Glacier where you will take your first steps in Antarctica. Climb aboard one of our specially-adapted vehicles for the 5 mi (8 km) shuttle to our main camp. Our friendly staff will provide a welcome tour of camp and show you to your tent. 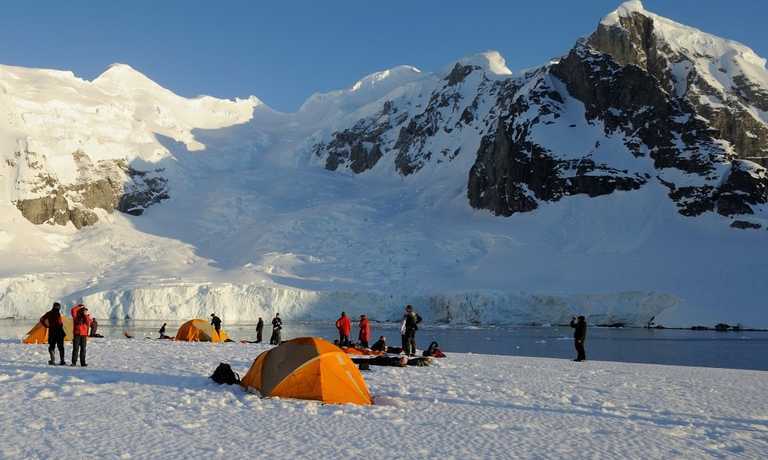 During your week stay in Antarctica, you’ll have multiple days to explore Union Glacier. Our meteorologists will carefully monitor the weather conditions and identify the best days for skydiving. A typical day at Union Glacier starts with a briefing after breakfast where you’ll meet with our Skydive Master to discuss the day’s options and choose an activity tailored to the weather and the group’s interests. Union Glacier excursions can include any of the following destinations: Elephant’s Head Ride in one of our wheeled vehicles to this dramatic marble buttress overlooking the blue-ice runway. Geology lovers will be delighted to find this is a hotspot for ichnofossils. Our experienced guides can help you navigate by GPS to known trace fossils or accompany you on a mission to discover new ones. For photographers, beautiful ice pools and moraines offer endless opportunities to capture close-up frozen formations or wide angle glacial landscapes. Hikers can trek up to the base of Elephant’s Head or all the way to the top of Rhodes Bluff for panoramic views of Union Glacier and the Heritage Range. Board our one-of-a-kind Tucker Bus, a custom designed tracked vehicle, for the scenic drive to the remote Buchanan Hills. You’ll arrive at a high pass that offers expansive views of Union Glacier as it flows into Constellation Inlet. Higgins Nunatak pokes through the ice, like an atoll in a frozen ocean. 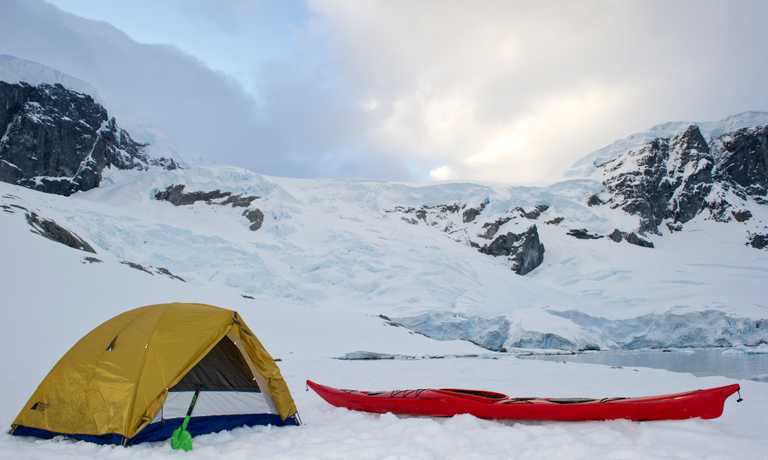 For the fit and adventurous, there are two easy hiking routes that require no prior experience and grant you the rare opportunity to summit a peak in the heart of Antarctica. Another spectacular setting for blue-ice photography and panoramic views! Take cross-country skis with you or a picnic lunch and enjoy Antarctica’s version of a glacial beach getaway. If you’d prefer to stay closer to camp, we have a variety of activities for all abilities. You can check out a pair of cross-country skis or a fat-tire bike and take a spin around our groomed 10k loop or you can enjoy a cup of tea, an Antarctic book, or fun game in our camp library. In the evenings, we regularly offer lectures and films tailored to your experience. To freefall over the Ellsworth Mountains of Antarctica is quite simply the most spectacular and surreal skydive you will ever have. The landscapes here are almost beyond words. Our experienced team will select the best possible times for your jumps and our Skydive Master will keep you informed of current weather conditions during daily briefings. Safety is our top priority and jumps will proceed as conditions and flight operations allow. When conditions are optimal, you will board the Twin Otter and head for the skies! Breathe in the crisp Antarctic air as you freefall for 50-60 seconds, high over the polar landscape, viewing mountain ranges, glaciers, and an endless expanse of white. Open your chute and gain a unique perspective on Union Glacier as you float towards your temporary home on ice. Ski-equipped Twin Otters are a staple in Antarctic aviation. They are used by ALE, the British Antarctic Survey, the United States Antarctic Program, as well as the Argentine and Chilean air force. The DHC-6 is a twin engine, turbo prop, STOL (short take-off and landing) aircraft is used throughout the world to access remote locations on wheels, floats, tundra tires and skis. Their rugged landing gear and STOL characteristics allow them to take off land where other aircraft cannot. The Twin Otter can accommodate up to 6 skydivers plus the Skydiver Master. You will land near our main camp on a 492 ft x 492 ft (150 m x 150 m) groomed drop zone. A 13 ft x 7 ft (4 m x 2 m) orange arrow will be placed within the landing area to indicate wind direction and the center of the drop zone. As a precaution, travel safety and medical personnel will be on standby at the landing area. All skydivers will carry a personal locator beacon, supplied by ALE, to locate you in the event of a landing outside the drop zone. We recommend booking your flight home one week after your return Antarctic flight. If you purchase a full-fare ticket, most airlines will allow you to move your departure date. It is important to give yourself a buffer as delays are common in Antarctic travel. Our Punta Arenas team can provide a list of local tour operators and excursions if you wish to explore Chile before you return home. When it is time for your flight home, our staff will provide transportation from your hotel to the Punta Arenas airport. 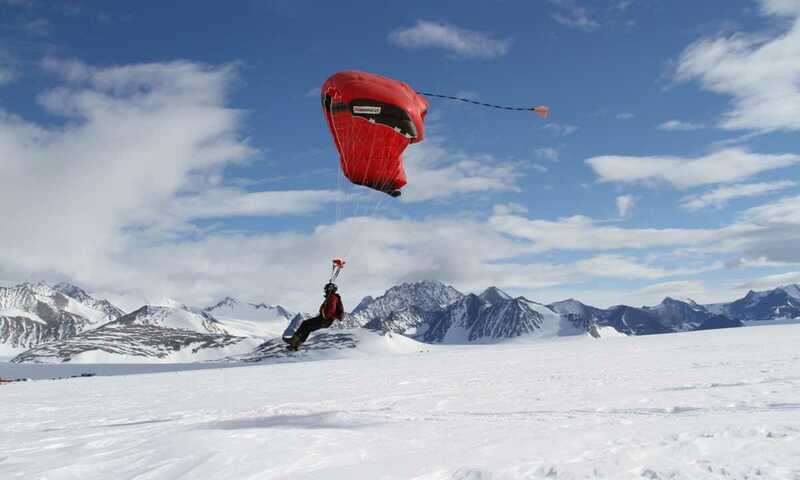 * Additional jumps may be booked in Antarctica contingent on weather and aircraft availability.